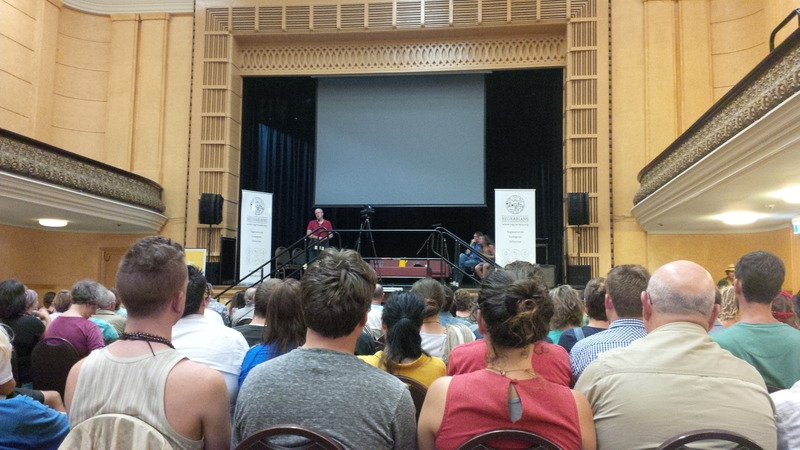 This Thursday we had the opportunity to attend a speech by Joel Salatin, one of the world’s most famous permaculture experts. Author of nine books, he’s a third generation alternative farmer running a farm in Virginia’s Shenandoah Valley that services 5,000 families, 10 retail outlets, and 50 restaurants. A local Australian organization called Regrarians has spent the past 3 years producing a documentary called Polyfaces, named after Joel’s farm that bears the same name. They organized an event in Melbourne called “Eat, Buy, Grow” where we mingled with local organic businesses, watched the trailer for their documentary, and then listened to a keynote speech by Joel. Joel began his speech by discussing the subject of orthodoxy. Most people associate the word orthodox with the likes of religious fanatics and crazy people on the fringes of society. However, all humans share the desire to conform to some type of orthodoxy. Orthodoxies are simply doctrines that have been generally accepted by the public as truth. More often than not, these orthodoxies are proven false as the human race develops, learns, and grows, but nonetheless we are drawn by a desire to explain things, reach consensus, and thus create orthodoxies. He then goes on to cite several orthodoxies through human history such as the concept that the world is flat, that the sun revolves around the Earth, that diseases were caused by evil spirits, and that leaches could cure illness. Joel then goes on to talk about the people that dare to challenge orthodoxy. These people are commonly labeled as heretics – people that blasphemously speak out against these orthodoxies. 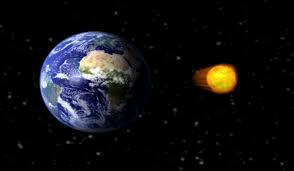 The first people to suggest that the Earth revolves around the sun were ridiculed as insane. “How could you possibly say the Earth revolves around the sun!? I mean every morning I watch it come up, and then as the day passes it moves up and over us!” Once society has reached consensus it becomes perceived as fact and most people don’t think to question the assumptions that underlie those perceived facts. The first step in finding a better way to do things is always to question the assumptions upon which the orthodoxy and status quo are built upon. Once these assumptions are altered, the entire system then begins to change shape. To illustrate his point, he offers three “new” assumptions. When nature is left to it’s own devices, things tend to work in complex harmonies that lead to a general state of well-being. This makes sense, because if the opposite were true then nature would cease to function. However, as human beings we seem to assume everything is broken. Milk isn’t correct when it comes out of a cow or goat. We need to pasteurize it, homogenize it, fortify it with vitamins. Now it’s milk! In a humorous example closer to home, he talks about how in the 1970’s most babies were fed baby formula because doctors said it was healthier than a mother’s own milk. He joked, “Think about all those unused breasts! I mean that had to have been one of the worst misallocation of resources throughout all of history!” Since then several health concerns have been raised, including a linkage to increased incidence of breast cancer. Back on the farm, if Bessy the Cow gets sick we assume that she must be “pharmaceutically challenged,” so we dose her up with medications to fix her. 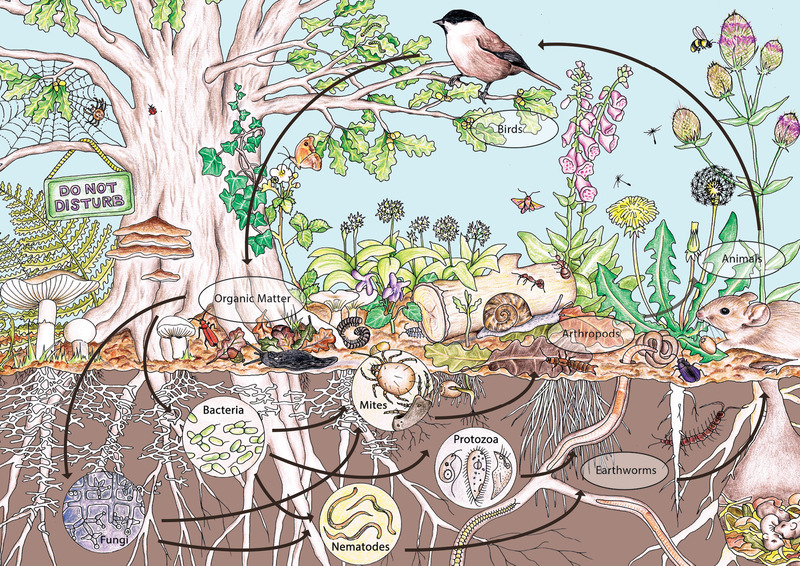 If we attempt to grow a plant in the wrong kind of soil or environment, our assumption is that the soil is broken so we pump it full of chemicals to fix it. Joel makes the opposite assumption: “If something on my farm isn’t working right, I pretty much assume I broke it!” If you make this alternative assumption, then your entire approach to farming must change. You must learn to work with the land, animals, and climate you have, adapt your own techniques to your surroundings. This requires a greater understanding of nature and the complex systems that make it functional and balanced, but in the end it is more correct and, once implemented, easier to run because it’s not forced. Joel makes the case that there is no ecosystem on the planet that doesn’t have animals, yet we as humans feel the need to separate our plants from our livestock, and go even further to separate individual crops from each other as well as our pigs from the cows from the chickens from the sheep. This process, which we do in order to increase our efficiency, is known as monospeciation and can actually have detrimental effects. It just so happens that pathogens have a difficult if not impossible time moving from one species to the next, so they inherently prefer monospeciation and tend to thrive in these environments. We then end up with issues such as increased disease and illness within our fields, flocks, and herds. To combat the issue we resort to measures like chemical treatment, which taint the food we then put into our own bodies. To illustrate what happens once you make the switch to assuming plants and animals should all freely mix, he jokingly talks about the life of a pathogen born on a rabbit turd. Much of this is borne out of our desire to become faster, cheaper, and more efficient at everything we do, but this can ultimately end up backfiring and doing more harm than good. Farmers once decided that to more efficiently use and raise cows, they would take parts of deceased carcasses, grind them up, and feed them back to the cows still alive. Eventually, we ended up with breakouts of bovine spongiform encephalopathy (BSE) or simply put: Mad Cow Disease. If the underlying assumption had been that nature is by default well, then the progression of thought would have dictated cows be allowed to eat what cows are supposed to eat, and we would not have ended up with the issues of Mad Cow Disease. Change the assumptions, change the system. This is a simple truth of nature, yet we humans seem to think animals need to be confined to tight spaces and lead sedentary lives. There are several dangers to doing things this way. One is the obvious propensity for disease when confining animals to minimal movement. The other, often overlooked, is what it does to the human condition of society raising animals in such a way. Joel makes the argument that when people become conditioned to accepting the mistreatment of animals, that they will inherently become conditioned to be less sensitive with their fellow human beings. Conversely, people who are raised to care deeply for the well being of animals will have a tendency to be more caring towards all life in general. Again, changing the underlying assumption changes all the systems in place resulting from that assumption. If we assume that animals are better off moving, then suddenly the farm setup changes. More fencing is required. Larger buildings are replaced by smaller, mobile feeding units that can be relocated around the land. Having more animal-friendly setups are entirely possible, but don’t happen because our underlying assumptions regarding their necessity are ultimately incorrect. Having farms that allow animals freedom of movement, encourage balanced ecosystems by interactions between the various plant and animal life, and that are free from chemical fertilizers and pesticides are entirely possible, but it requires a knowledge that unfortunately has been all but lost. Joel points out that if you asked the average person today if they could name four vegetables that grow below the ground, four that grow above the ground, and what the difference between a perennial and an annual is, that they would not know the answers. He joked that some people who have visited his farm didn’t even know chickens had bones! However, if you’d asked our grandparents’ generation the same questions, they would fire back answers quickly without even having to think. This knowledge has been lost from our society, and when knowledge is lost that leads people to ignorance. When people become ignorant, they become fearful because humans naturally fear what they do not know. When they fear something they turn to the government to keep them safe. We end up with agencies and laws passed in an effort to protect us from ourselves. Pasteurize this, homogenize that, regulations, FDA approvals, inspectors, bureaucracy. What you get is a nanny state, government largess, and a population of people who are incapable of taking accountability for their own well-being and always quick to blame somebody else when things go wrong. Change always starts from the outside and works itself in. The first people to question the assumptions that form the basis of the orthodoxies that drive our daily actions are the first people to get laughed at, ridiculed, and prosecuted. However, history has proven time and time again that more often than not it is the heretics that are ultimately right. The best ideas and the greatest innovations come from the weirdos on the fringe of society, so embrace this. Do not be ashamed to be a heretic, for it is this contrarian thinking that shapes the future. I walked away from his speech feeling particularly good that we’ve decided to move our family towards this way of life. There’s a lot to learn and it won’t be a quick journey, but our world is changing and we must not only change with it, we must become the driving force of the change itself.